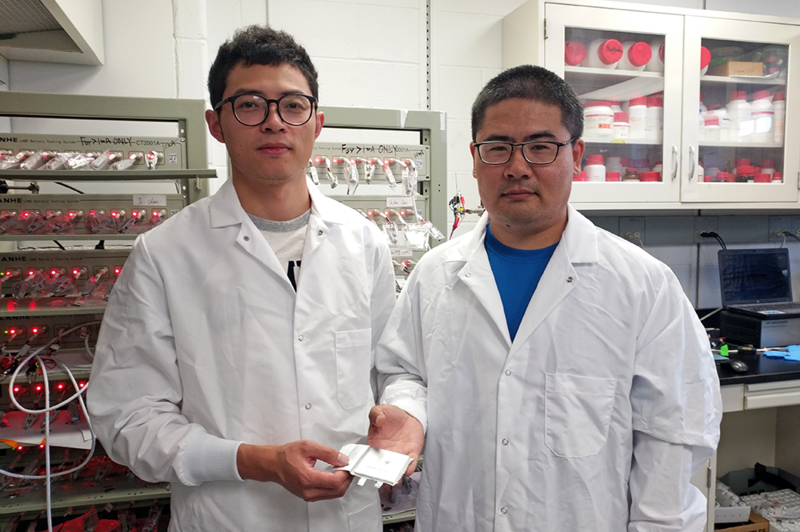 Co-first-authors Long Chen (L) and Xiulin Fan (R) hold their newly-created rechargeable battery made with fluorine, a long-lasting and safe combination. College Park, Md. — A team of researchers from the University of Maryland, the Army Research Laboratory and Argonne National Laboratory (U.S. Department of Energy) has published findings on a new advanced battery technology that among its many possible applications has the potential to improve electric vehicle batteries in two key areas: driving range and battery safety. The UMD-led team has created a reliable battery with significantly higher energy storage capacity, more efficiency and greater safety than current batteries. Their peer-reviewed paper on the research was published July 16 in the journal Nature Nanotechnology. The driving range of an electric vehicle is directly proportional to the capacity, or energy density, of its batteries. Energy density is a battery’s energy output by unit weight. A battery technology that can safely deliver high energy density is widely seen as the Holy Grail for electric vehicle batteries. 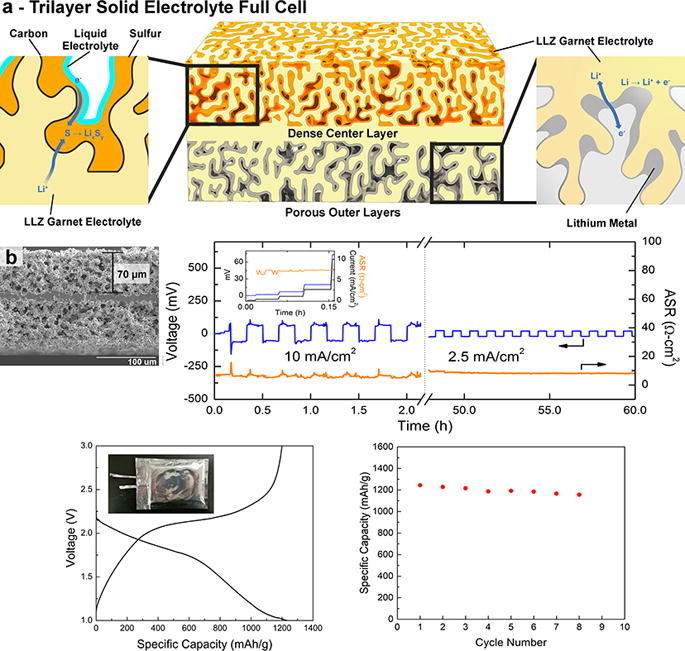 To create their new battery, the UMD-led team started with an electrode material, Li-metal, which in theory can deliver the highest possible energy density. However, Li metal is extremely reactive. To stabilize this potent battery material, the team used a “secret” ingredient the element fluorine to create a safe electrolyte. The electrolyte is the solution in a battery that allows electricity in the form of electrons to flow between the two battery terminals (electrodes). 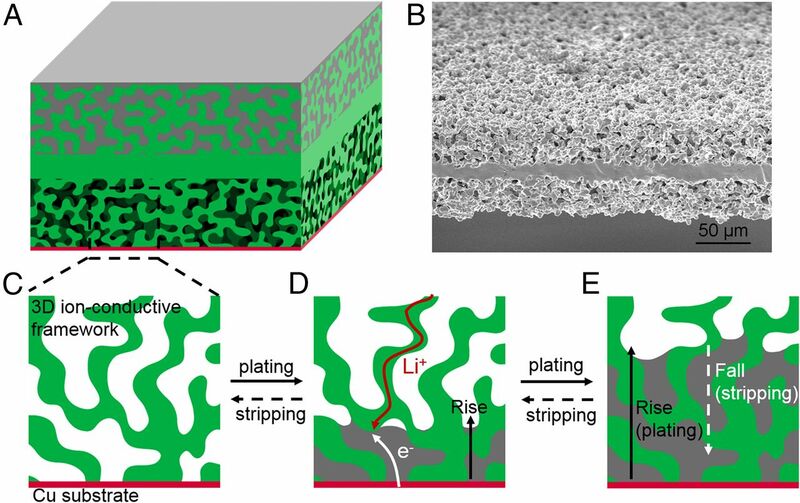 Using this safe, stabilizing electrolyte, allowed the researchers to use Li metal, coupled with other highly-reactive electrodes, to generate energy densities that far exceed that of current state-of-the-art Li-ion batteries. The researchers say the use of fluorine in the electrolyte, prevents the formation of small defects in the battery that could cause it to break down or catch fire, also makes the electrolyte completely non-flammable as well. "We have created a fluorine-based electrolyte to enable a lithium-metal anode, which is otherwise known to be notoriously unstable, and demonstrated a battery that lasts up to a thousand cycles with high capacity," said co-first authors Xuilin Fan and Long Chen, post-doctoral researchers at the University of Maryland. The new batteries can thus charge and discharge many times over without losing the ability to provide a reliable and high quality stream of energy. Even after a thousand charge cycles, the fluorine enhanced electrolytes ensured 93 percent of battery capacity. This unprecedented technology could reliably power electric vehicles or be used for many other applications such as smartphones, power tools or large format batteries for grid-storage, the researchers say. "The cycle lives [recharging ability] they achieved with the given electrode materials and operation voltage windows sound 'unprecedented'. 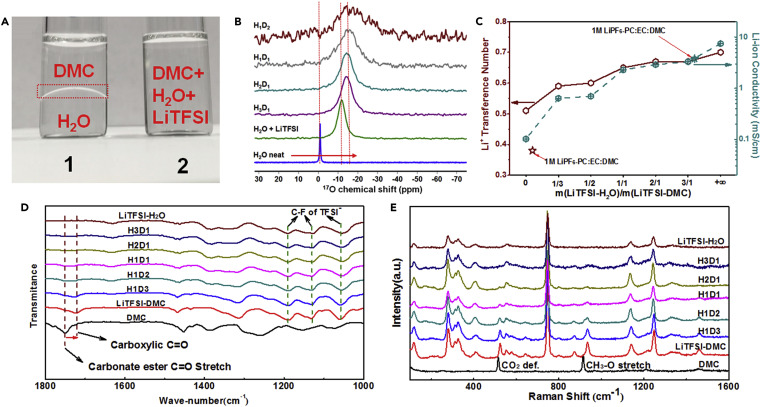 This work is a [sic] great progress forward in the battery field in the direction of increasing the energy density, although further tuning might be needed to meet various standards for commercialization," said Jang Wook Choi, an independent battery expert who is an associate professor in chemical and biological engineering at Seoul National University in South Korea. Choi was not involved with this research. The team demonstrated the new batteries in coin-cell shape like a watch battery for testing, and is working with industry partners to use their approach for a high voltage battery. Materials, such as Li-metal anode and high nickel and high-voltage cathode materials, used in this new battery are called "aggressive" materials because they react strongly with other material, meaning that they can hold a lot of energy but also tend to "eat up" any other elements they’re partnered with, eventually rendering them unusable. 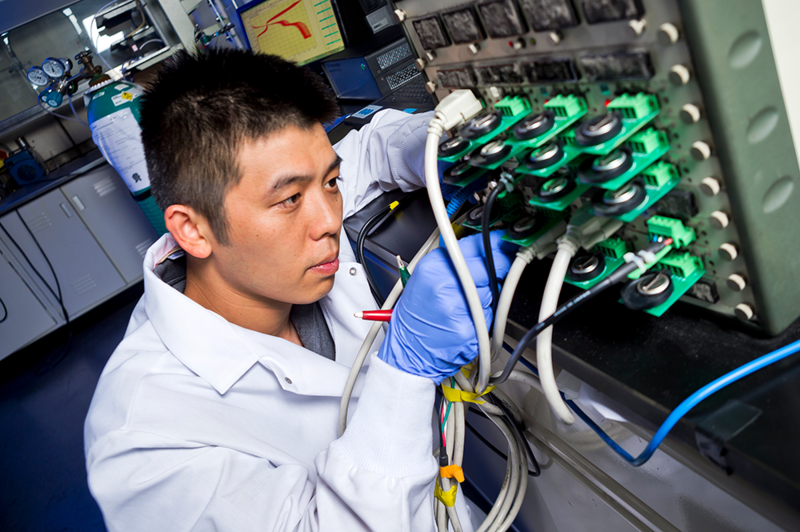 Chunsheng Wang, a professor in the Chemical and Biochemical Engineering Department of the University of Maryland in College Park, has collaborated with Kang Xu at ARL and Khalil Amine at ANL on these new electrolyte materials for batteries. Since each element on the periodic table has a different arrangement of electrons, Wang studies how each permutation of chemical structure can be an advantage or disadvantage in a battery. 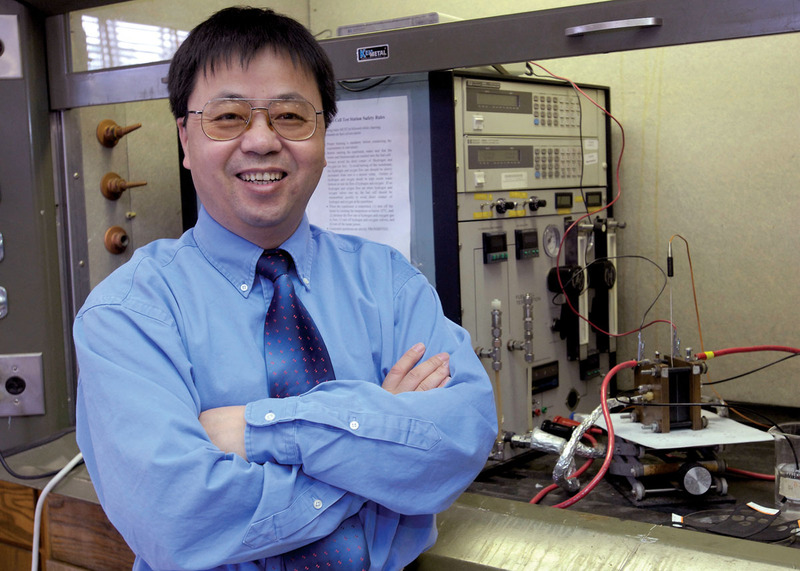 He and Xu also head up an industry-university- government collaborative effort called the Center for Research in Extreme Batteries, which aims to unite companies that need batteries for unusual uses with the researchers who can invent them. "The aim of the research was to overcome the capacity limitation that lithium-ion batteries experience. We identified that fluorine is the key ingredient that ensures these aggressive chemistries behave reversibly to yield long battery life. An additional merit of fluorine is that it makes the usually combustible electrolytes completely unable to catch on fire," said Wang. The team captured video of other battery cells catching on fire instantly, but their fluorine battery was impervious to this problem. "You can find evidences from literature that either support or disapprove fluorine as good ingredient in interphases," said Kang Xu, a laboratory fellow and team leader of the research at the Army Research Laboratory. "What we learned in this work is that, in most cases it is not just what chemical ingredients you have in the interphase, but how they are arranged and distributed." 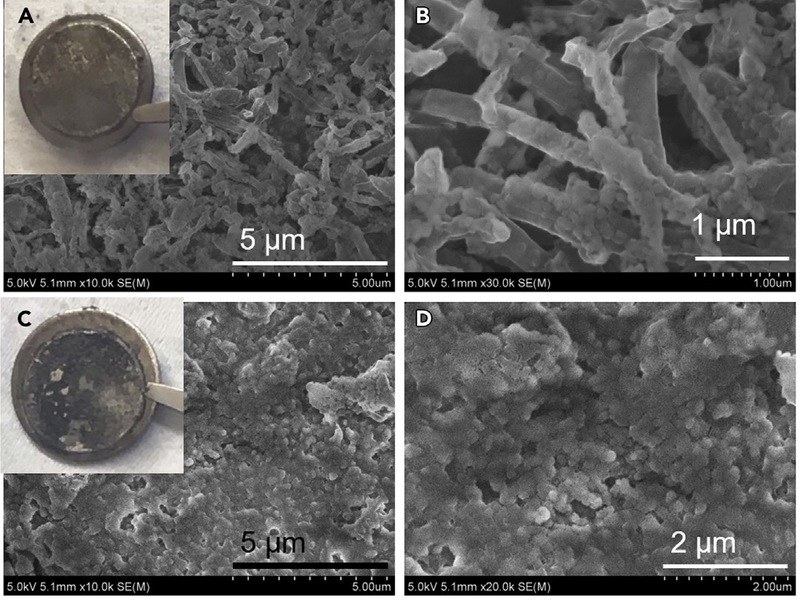 "We believe these fluorinated interphases serve as the key stabilization barriers to enable these aggressive electrode materials," Xu said in an email. 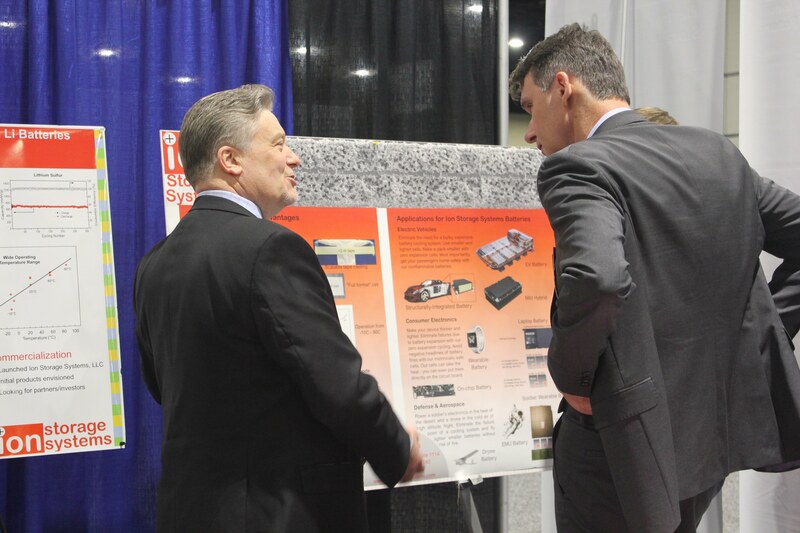 This work was supported by the US Department of Energy (DOE) under award no. 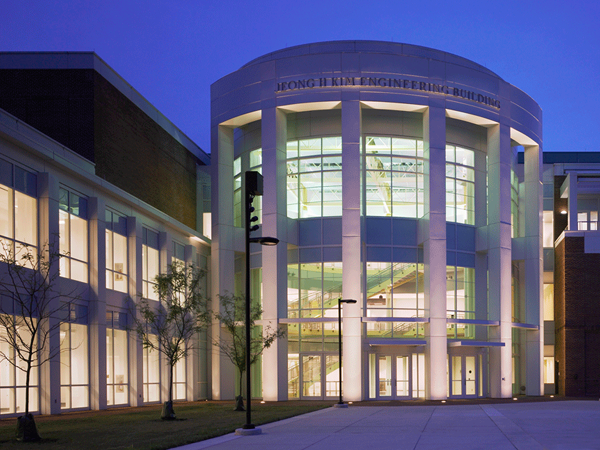 DEEE0008202 and DEEE0008200, and by UMD’s Maryland NanoCenter and its Advanced Imaging and Microscopy (AIM) Lab.